If you ask around Washington D.C., the Republican Party could have a no-brainer opportunity to claw its way back toward a triumphant and diverse majority -- or it could be on the verge of legislating itself out of existence. Since the 2012 election, when Latino voters selected Barack Obama over Mitt Romney by nearly a 3-1 margin, proponents of comprehensive immigration reform have pointed to the passage of the legislation as a political imperative for the survival of the GOP. Opponents of the legislation, on the other hand, have questioned whether the embrace of a bill that contains a path to citizenship for undocumented immigrants would have any long-term political benefit for Republicans. Former WH Hispanic Media Dir. Luis Miranda, the Washington Post's Nia-Malika Henderson and National Review/CNBC's Robert Costa, join The Daily Rundown gaggle to talk about the progress of the Senate's immigration bill, the scandals plaguing the White House, and Obama's visit to the Jersey Shore. So how would the passage of an immigration bill really change the way the country votes -- especially as Hispanics swell to a bigger share of the electorate? Republicans who are skeptical of the reform effort point to data showing that Hispanics lean towards the liberal side of the political spectrum, while those on the other side of the issue argue that Hispanics share important social and fiscal values with the GOP. And some in the party are simply eager to move on from a national debate fraught with the risk that one tone-deaf comment -- like Rep. Don Young’s reference to “wetbacks” earlier this year -- can erase months of progress in widening the party’s appeal. Both sides agree it’s generally true that, right now, Latinos are primarily a Democratic constituency, demonstrated in no small part by the fact that the Democratic candidate has won the Latino vote in every presidential election since at least 1972. An April 2013 survey by the Pew Hispanic Center showed three in 10 Latinos surveyed described themselves as “liberal,” compared to 21 percent of the general population. And 75 percent of Hispanics surveyed said they prefer “a bigger government providing more services” to a smaller government providing fewer. Steven Camarota, the director of research for the Center for Immigration Studies -- a group that supports limitations on legal immigration and has opposed the Senate bill’s provisions -- says that’s bad news for Republicans. “Continuing ongoing levels of legal immigration likely will continue to shift the national electorate towards the Democratic Party and toward greater sympathy for government intervention in the economy,” he said. Other Republicans optimistic about growing the GOP’s appeal among Hispanics see plenty of bright spots in the data. The overwhelming preference for a larger government diminishes the longer Hispanics have been in the country, for example. While 81 percent of new Latino immigrants said they prefer a bigger government, the share goes down to 58 percent for those who are third-generation immigrants or more. Latinos are also the fastest-growing group of small business owners in the country. And on some measures, including frequency of church attendance and opinions on abortion rights, Hispanics tend to be more culturally conservative than the public-at-large. 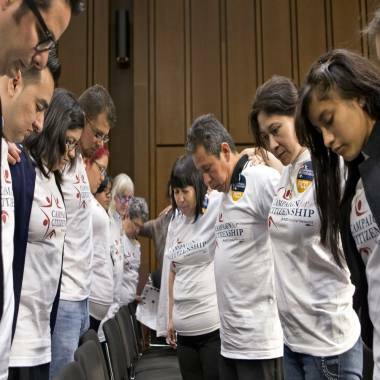 Immigration activists gather on Capitol Hill in Washington, Monday, May 20, 2013, before the Senate Judiciary Committee began working on a landmark immigration bill to secure the border and offer citizenship to millions. Korn’s new role at the RNC is to engage the Hispanic community nationwide and help implement the party’s “Growth and Opportunity Project,” which included recommendations for building better connections with minorities, women and young voters. Dr. Matt Barreto, a co-founder of polling group Latino Decisions, says that Republican rhetoric about illegal immigration, not conflict with an overarching political ideology, is mostly to blame for the party’s dismal performance with Latinos. So, would those voters consider a Republican candidate if the GOP played ball on the passage of immigration reform? A poll by Latino Decisions and America’s Voice in March of this year asked Hispanic voters that question. Asked if they would be “more or less likely to vote for a Republican candidate in the future if Republicans take a leadership role in passing comprehensive immigration reform including a pathway to citizenship,” 44 percent of those surveyed said they would be more likely to support a Republican. And a majority of Hispanic voters (63 percent) also said they would back a Republican candidate who supported a “pathway to citizenship” over a Democratic candidate who didn’t. Potential GOP fears also increase at the threat of an influx of new, previously undocumented Hispanic voters who eventually earn the right to vote after becoming U.S. citizens – a process that would take most applicants more than 13 years. But it’s unclear what percentage of the estimated 11 million illegal immigrants in the country will choose to work their way toward citizenship rather than remaining legal permanent residents – who don’t have voting rights. Skeptics charge that those granted citizenship will be so dependent on government programs that they will never support a Republican Party largely dedicated to scaling back the size of those programs. Data from the 2010 American Community Survey does indicate that foreign-born individuals in the U.S. – meaning naturalized citizens as well as legal and undocumented residents – are more likely than natural-born Americans to lack a high school diploma or live below the poverty line, both indicators of dependency upon federal benefits. But while immigrants are more likely to be low-income and thus eligible for benefits, some studies – like from the libertarian Cato Institute -- dispute that immigrants actually access those benefits at a higher rate than their counterparts in the native-born population. No matter how many reams of data are available to each side, questions about the political impact of immigration reform won’t stop before the legislation meets its eventual success or failure after a full-throated debate on the airwaves and in the halls of Congress. “This is a perfect opportunity for the Republican Party to reverse this very negative image that they have, to try to be associated with positive outreach to this new community and ‘say we are part of the solution,’” says Barreto. Camarota of the Center for Immigration Studies believes just the opposite.